The fifth and sixth albums from Oxford indie rockers Foals are coming this year, and now we know exactly when they will arrive. The band revealed the release dates for Everything Not Saved Will Be Lost Part 1 and 2 via their social media channels on Monday morning: March 8 and Autumn 2019, respectively. Alongside their release date reveal, Foals put out a new teaser for their albums, the second they have shared thus far. The foreboding clip, directed by Albert Moya and produced by CANADA (as was its predecessor), is set to an atmospheric synth line that wouldn’t sound out of place on the Stranger Things soundtrack, with a distorted guitar only breaking the electronic reverie’s spell in the teaser’s closing moments. Foals announced their new albums last week, revealing Everything Not Saved Will Be Lost’s title and first teaser. 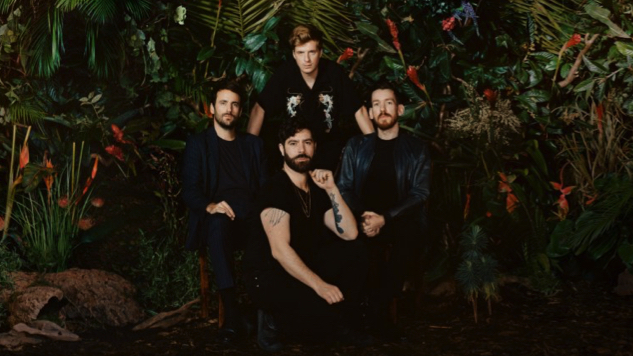 The band also clarified in an Instagram response to a fan that the album is two albums, as opposed to one split into two parts—titling it as they have would appear to directly contradict that, but new Foals is new Foals. Everything Not Saved Will Be Lost will be Foals’ first new album(s) since 2015’s What Went Down, as well as their first release as a foursome—long-time bassist Walter Gervers left the band in January 2018, ending a 12-year tenure. Watch the band’s new album teaser and revisit their 2008 Daytrotter Session below.